Driving to a planroom, flipping through plus-sized blueprints, busting out your scale ruler, and writing down each measurement by hand. This was the way takeoffs were done in the not-so-distant past. In today’s information age, online digital takeoff tools have replaced these physical tools. 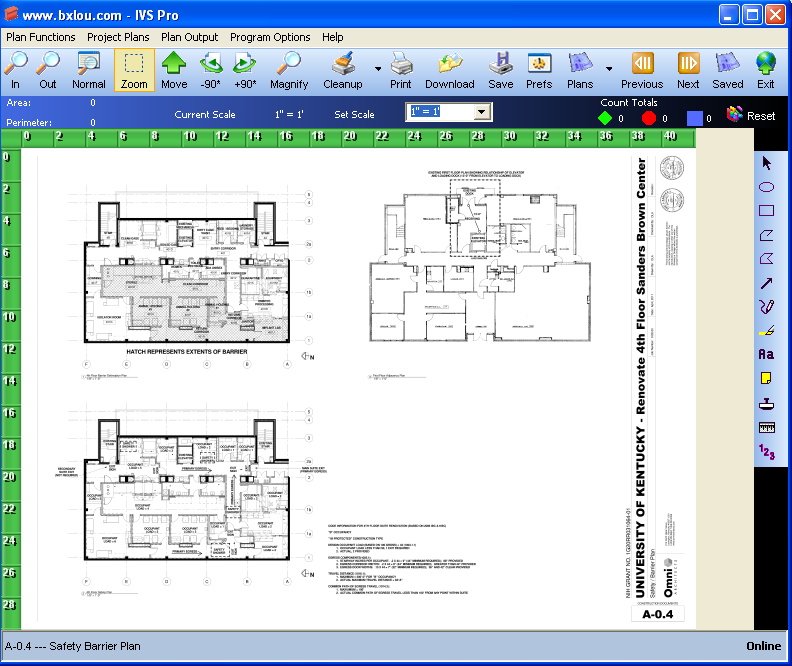 Builders Exchange members have access to one such powerful tool: the IVS Pro Viewer. Last month I covered the IVS Lite Viewer; our plan viewer that gives members the ability to quickly view, print and save plans. In this edition I’ll cover the basics of the IVS Pro Viewer and the first five major measurement and markup tools. 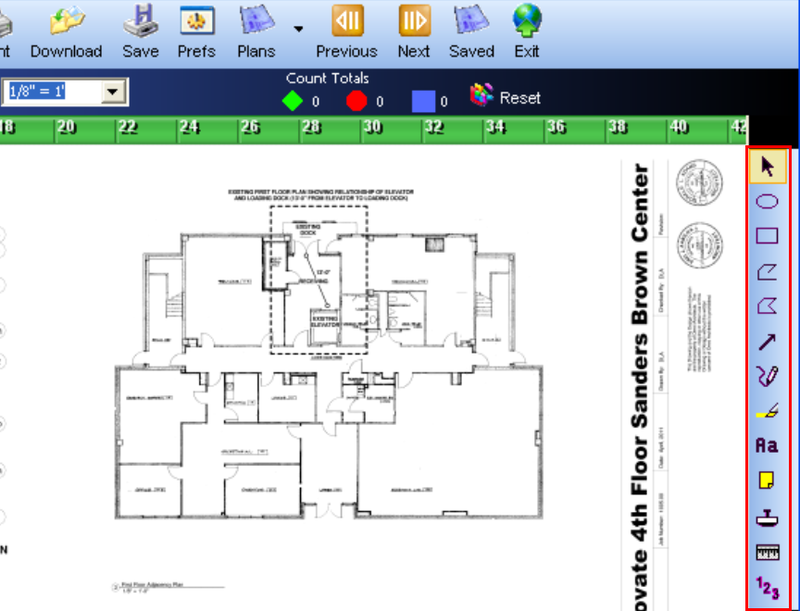 The Pro Viewer includes most of the tools that the Lite Viewer features: the ability to zoom in and zoom out, magnify specific areas, jump to different sections of the plans, and save and print documents. In fact, the two viewers are so similar that all of the viewing tools covered for the Lite Viewer work the same way for the Pro Viewer. If you need a refresher on these functions, refer to last month’s tip (linked above). 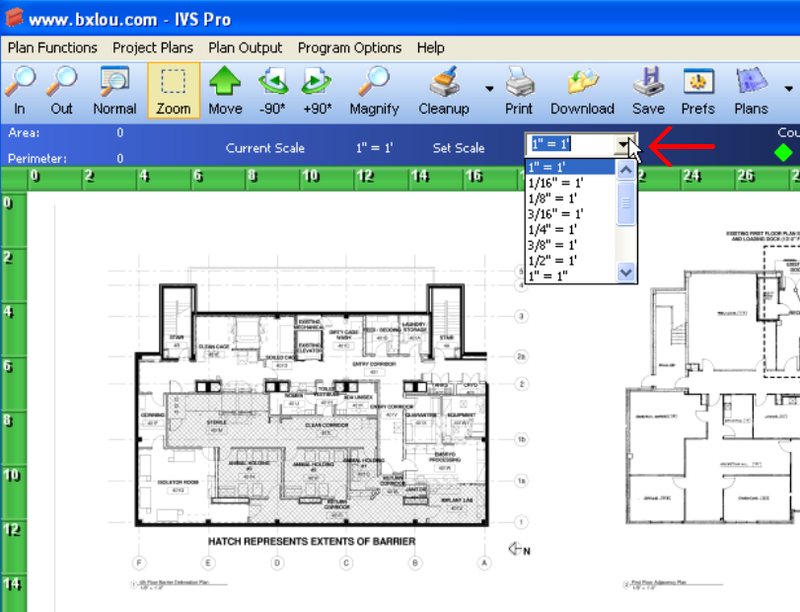 The Pro Viewer is an enhanced version of the Lite Viewer that gives members the tools to markup and measure plans online. All measurements will now correspond to the currently selected scale. Note: this means that when you change scales, all measurements will change regardless of which scale was chosen at the time the measurement was placed onto the blueprint. I’ll be covering the first five tools in this month’s edition (look for Part 2 in September). 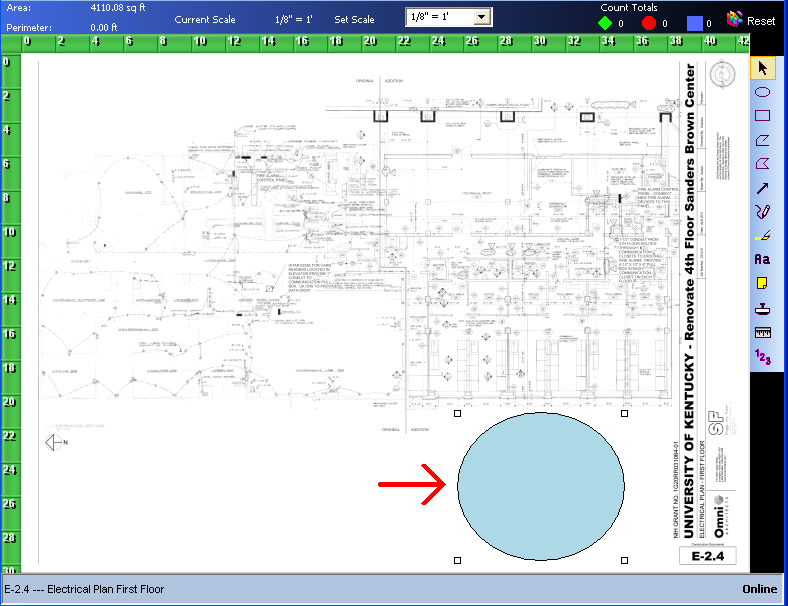 Select Tool: Select measurement, tools, and markups already placed on the drawing. This is the default tool, which looks and operates like a standard arrow cursor. It is always selected immediately after using another tool and is used to click, drag, and make changes. 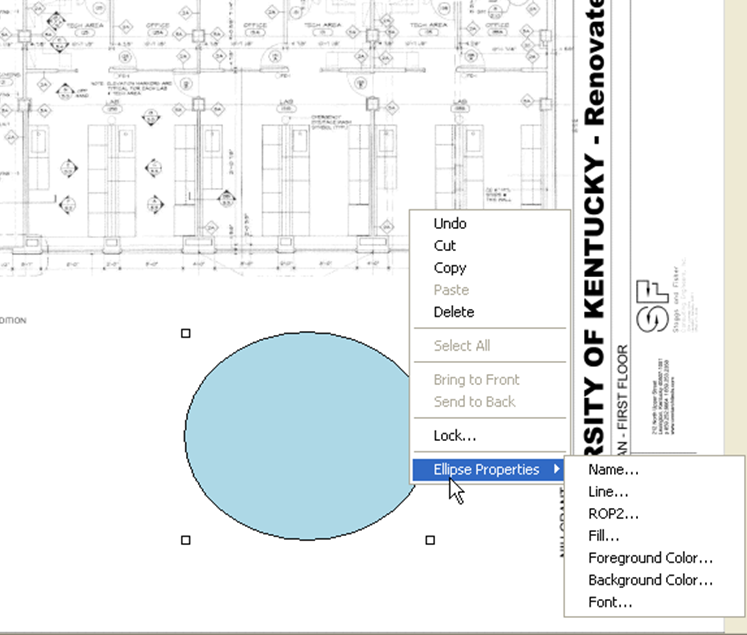 Oval Tool: Place a circular shape over an area of the plan to determine the area of the figure. The small white squares on the four corners of the oval can be manipulated to increase or decrease the oval’s footprint. Note that this is the case any time these squares are visible on a figure or measurement. You can use these manipulable squares to obtain very precise measurements by ensuring that the markup is the exact size of what is being measured. The markup can also be moved to any other area of the drawing by left clicking and holding on center, dragging it to the desired location, and then releasing the left mouse button. Finally, right click on the figure to bring up a menu of options for the oval. You can delete, cut, copy and paste the oval (or any other markup) from this menu. Clicking on “Ellipse Properties” (the oval is also called an ellipse…go figure) gives you the option to name the oval and change its color (click on “Background Color”), amongst other options. This menu of options is available on most of the other markup tools by right clicking anywhere on the body of the markup. 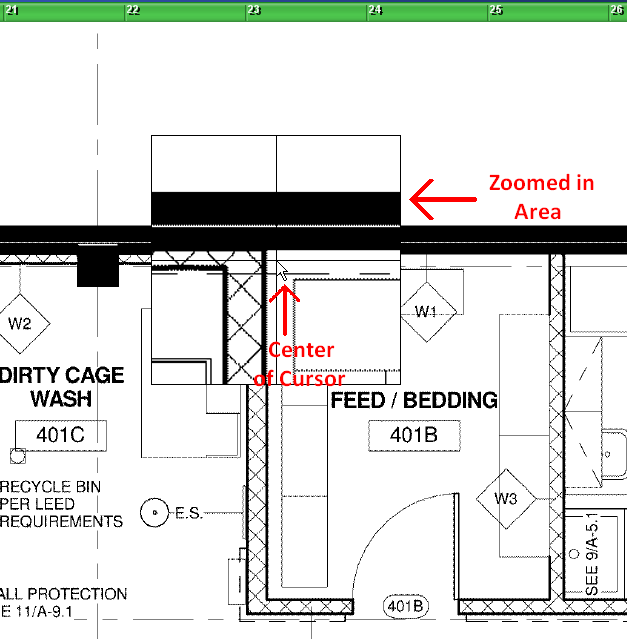 Rectangle Tool: Place a four-sided shape over an area of the plan to determine the area of the figure. This tool is operated exactly the same as the oval tool. Refer to the oval tool above for instructions. 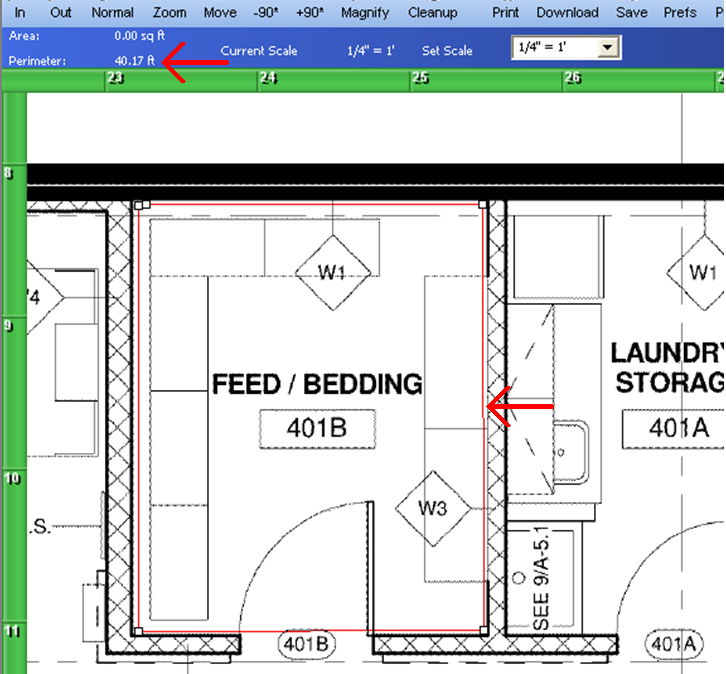 Complex Linear Measurement Tool: Measure the length or perimeter of any distance, wall, or surface on the drawing. Release the left mouse button to place the first point onto the blueprint. When you move the cursor, you will notice a black line trailing from the first point. This helps you keep track of each previously placed point. Step 2: To place the next point, repeat the process from step 1: click and hold the left mouse button to magnify and then let go to place the next point. TIP: Don’t worry if you did not place the point exactly where it should be: you will be able to fine tune it later). 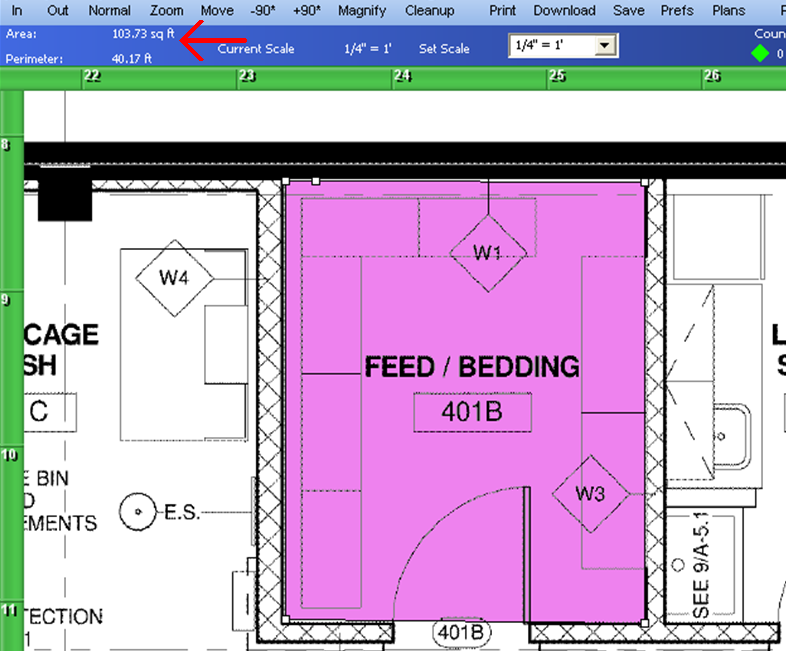 As with the Oval and Rectangle tool, each point with a manipulable square can be clicked and dragged to fine-tune and adjust the markup so it is exactly where you need it to be to obtain an accurate measurement. The irregular area tool is utilized identically to the Complex Linear Measurement tool. The difference is the appearance of the figure and the measurements given after you have double-clicked and placed your last point. Don’t forget that you can name this markup, change it’s color, and make other changes be right clicking and accessing its properties from the menu. Make sure to save your drawing with markups on the top toolbar before you move on to another drawing or close the viewer. Failing to save will result in the loss of all your markups and measurements! Feel free to call or e-mail me, Aaron Thomas, at 502-459-9800 if you have any additional questions on the markup tools presented above or the IPIN system in general. Thanks for reading and look out for Part 2 in September, which will cover the eight remaining markup and measurement tools. Feel free to experiment with them in the meantime (hint: they work similarly to the other tools).